More than 160 farms in South Africa legally breed lions to be hunted by wealthy trophy hunters in a practice called "canned hunting." 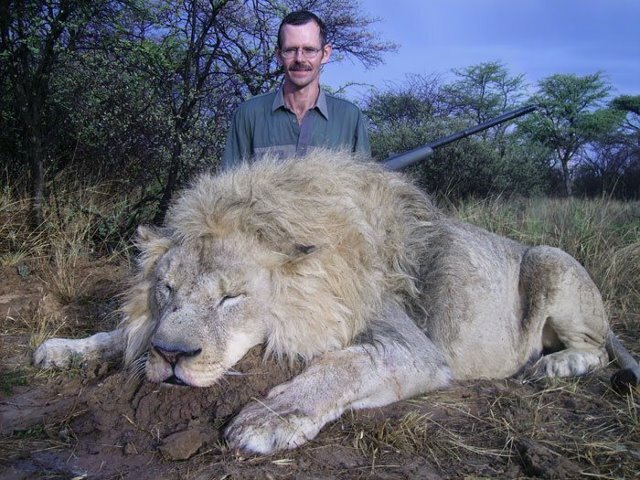 In the practice of "canned hunting, a fully-grown, captive-bred lion is released from its pen into an enclosed area where it wanders, confused, before being shot by a hunter with a shotgun, handgun, or crossbow back the back of a truck. Hunters from North America and Europe flock to participate because of the high probability of a kill and because of the cost. They would pay $75,000 to hunt a lion in the wild in Tanzania but only between $8,000 and $40,000 in a captive facility in South Africa. The industry relies on an efficient system of lion "factory-farming." The captive cubs are usually separated from their mother within an hour of birth by sounding a blowhorn to scare the mother away. Then they are bottle-fed by humans for the first 8 weeks of their lives. People in the industry claim to do this because the mothers often do not produce milk, and they must save the cubs from starvation. But animal welfare experts disagree. They say that lionesses rarely have problems producing milk and that breeders actually use this practice to increase the rate at which lions reproduce. When one litter is taken away, the mother goes back into reproductive season much faster than if she raised cubs. Five litters can by squeezed out of her within two years, a period over which she would naturally produce only two litters. And removal is not good for the cubs. By taking them away so quickly, they do not get to drink colostrum, the first milk from their mother that contains crucial antibodies and nutrients. Missing out on colostrum and the six months they typically spend nursing causes many cubs to develop ill health. Unfortunately this awful practice is increasing in popularity. From 2006 to 2011, the number of trophy lions exported from South Africa increased by 122%. Various charities and sanctuaries take in abused lions, but their capacity is limited. Legislation has been proposed to ban lion breeding, but powerful and well-supported lobbies from the industry have turned legislators in their favor. If hunters cannot be educated to withdraw support for this disgusting industry, then the public must voice their opposition in order to pass legislation against it. Seal culling: for conservation or clothing? Did sick kids make me invincible? Lions and tigers and...small African wild cats? The Rhino Poaching Situation Could Cause a War?